Video from 2012: After a sudden heart attack, Emory neonatologist Lucky Jain learned important lessons as a patient. Lucky Jain, MD, MBA, has been named chair of the Department of Pediatrics at Emory University School of Medicine; chief academic officer of Children's Healthcare of Atlanta; and executive director of Emory + Children's Pediatric Institute. Jain, who is the Richard W. Blumberg Professor, has served as interim chair of the Department of Pediatrics since July 2015. He joined Emory in 1994 as associate professor and was promoted to professor in 2001. Jain was a member of the inaugural class of the Woodruff Leadership Academy and received an executive MBA from the Goizueta Business School at Emory in 2004. In 2006, he was appointed medical director of Emory-Children's Center and executive vice chair of the Department of Pediatrics. "Dr. Jain has been a visionary leader of pediatrics for the past two years, and his knowledge and experience will be essential as we continue to grow and develop the relationship between Emory and Children's Healthcare of Atlanta," says Jonathan S. Lewin, MD, Emory executive vice president for health affairs; executive director of the Woodruff Health Science Center; and president, CEO and chairman of the board of Emory Healthcare. 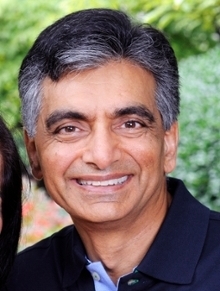 "Dr. Jain is a tireless advocate for physician wellness, work-life balance, and compassionate patient and family care, and his passion and leadership will be critical as we strengthen our collaborative relationship with Children's," says David S. Stephens, MD, interim dean of Emory School of Medicine and vice president for research in the Woodruff Health Sciences Center. Jain is married to Shabnam Jain MD, an Emory faculty member in pediatric emergency medicine.